If I had my way, I would drop everything and travel the world. I would visit states I’ve never been to and countries I’ve only seen in movies. I would learn about different cultures and eat local cuisine. Unfortunately, I have neither the money nor the means to make this a reality right now, but I have been lucky enough to visit a few new places on mission trips. When I was in college in Georgia, I went on mission trips to Kentucky, Texas, and East Asia. They weren’t glamorous trips full of sight-seeing and relaxing, but it was a fantastic way to visit new places all while sharing the love of Christ with others. That’s what mattered. 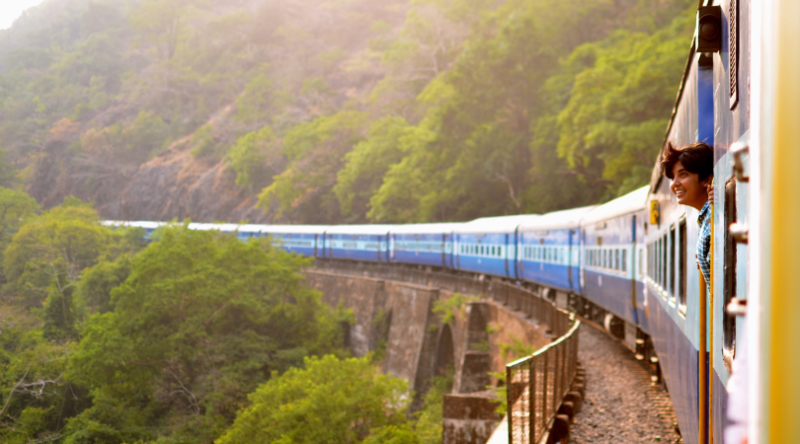 Traveling is fantastic, but when there’s meaning behind it? I’m all in. Making a difference in the lives of others is important to me, especially when I get the opportunity to share Christ with those who may not otherwise know about Him. This what I love about Christian Women’s Job Corps (CWJC). There are sites all over the United States where volunteers work hard to teach life skills but also the love of Christ. There are women who are struggling financially or who just need help getting back on their feet, and there are so many tangible ways we can help these women have a brighter future. CWJC is a place where there is Bible study and prayer but also discipleship through missions. It’s not just a way to find a job. It’s a practical program with a purpose. What are you doing to share the love of Christ with others? A great starting point is becoming a monthly partner with the WMU Foundation by giving to the Dove Endowment for CWJC. Your monthly gift will help women who are working toward a better future. We can help make the impossible possible for these women. I may not get the chance to travel the world anytime soon, but I can make a difference right here in my own community, and that is more than enough for now. On Sandra Waters’ refrigerator there’s a handmade card with a photo that smiles back at her every time she looks at it. But it ended much sooner than anyone could’ve imagined, at least the chapter here on earth. Suyderhoud passed away suddenly and unexpectedly in 2015. “Carolyn — or ‘Caroline in the morning,’ as we called her — was a brilliant gem,” Sandra said. For 22 years, Carolyn, Sandra, and their husbands — both named Richard — shared in friendship and ministry together at Cedar Grove Baptist Church in Warsaw, Missouri. Over many a plate of Mexican food, the group listened to Carolyn share her heart for people — especially children and the terminally ill.
Carolyn had a doctorate in biblical theology, and she felt like her theology had practical application. Carolyn was a chaplain for a local hospice and volunteered as a grief counselor. She also served on the boards of the Missouri Baptist Children’s Home and LIGHT Ministries, which provided maternity care and adoption services for young mothers. It’s a legacy worth honoring, Sandra said. That’s why she’s wearing her “For Such a Time as This” T-shirt in Carolyn’s honor on International Women’s Day on March 8. That’s why Sandra kept the card on her refrigerator, too — to remind her of her friend and the way she lived as though every minute of her life had a divine purpose. She also made them for hospice patients and for the women at the Cedar Grove Ladies Outreach Group, a ministry she helped start in 1992 to find ways to assist people in need. And after Carolyn passed away, her husband found a whole stack of handmade cards in her craft room ready to be delivered to hospice patients. Sandra is wearing a “For Such a Time as This” T-shirt made by the Begin Anew refugee artisan group. 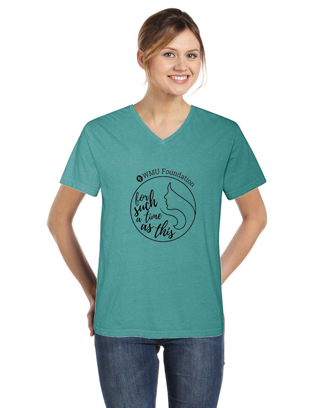 The $2,585 raised from these T-shirts supports women receiving job and life-skills training at Christian Women’s Job Corps sites through the Dove Endowment for CWJC. Partner with us to support women as they work towards a better future in Christ by making a gift to the Dove Endowment for CWJC. The Dove Endowment supports Christian Women’s Job Corps by providing scholarships to participants, program development grants for sites, and a grant for Dove Award recipient. We’re celebrating International Women’s Day (March 8, 2019) by supporting women around the world through the sale of our For Such a Time As This T-shirts. WE ARE NO LONGER TAKING ORDERS FOR THESE T-SHIRTS BUT YOU CAN STILL SUPPORT WORLDCRAFTS AND BEGIN ANEW THROUGH THE PURCHASE OF THEIR PRODUCTS OR SUPPORT WOMEN THROUGH CWJC BY GIVING TO THE DOVE ENDOWMENT. 100% of your gift supports Christian Women’s Job Corps (CWJC) through the Dove Endowment. How will you support women around the world by getting a T-shirt? Your gift supports women like Dove Award recipient, Akevia Wilson, who, through Christian Women’s Job Corps, went from being homeless to achieving all A’s and receiving her education degree. Your gift to the Dove Endowment makes it possible to grant the Dove Award and provides funding for scholarships for several CWJC participants each year (those who are pursuing more education and those who need special assistance to complete the CWJC program). It also provides grants to help CWJC sites develop new programs that benefit participants. Your gift supports women like WorldCrafts’ Begin Anew refugee artisans who screen-print the shirts in the USA and are a part of a CWJC in Middle Tennessee. Through this CWJC site, refugees learn to speak English, develop job skills, and receive words of eternal hope. Your gift supports women around the world for International Women’s Day! Thank you for creating opportunities for women through your gift. If you have any questions, you can call the WMU Foundation at (205) 408-5525 or email us at wmufoundation@wmu.org.